Sunday’s 88-57 defeat by Essex Rebels in Colchester was Pride’s tenth in 11 games in 2019 and dealt a further blow to their chances of reaching the end-of-season play-offs. Pride beat Rebels by 16 points in Paisley in December, but their hopes of a repeat victory were greatly reduced when top scorer Weledji went off after barely three minutes. “It looks like she has partially ruptured her Achilles tendon, but we’ll have a better look later,” revealed head coach Bart Sengers. Despite losing their talisman, the visitors led 23-20 at the end of the opening quarter, but it was a different story after that as Essex eased ten points clear by half-time and continued to extend their lead as Pride landed just 17 field goal attempts out of 66. Sian Phillips fared best with 18 points – 17 coming in the first half – and also added 14 rebounds, while Sengers praised St Mirren’s Iona Ross who contributed 15 points plus nine rebounds. “Iona stepped up, scored for us, shot the three well and got us rebounds, so that was a big positive,” he said. “We lost Tia after three minutes and Hannah Robb was in foul trouble most of the time, so we had a team where two 18-year-olds were the most experienced players. We should still have been better. We had some good spells and some poor spells and we got the gap down to six points in the third quarter, but our turnovers came back to haunt us. 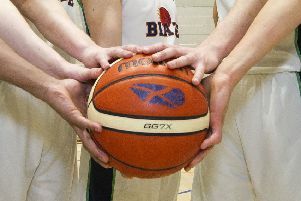 Pride face mid-table Oaklands Wolves in another “must win” game in London on Saturday, while holders City of Edinburgh Kings play Falkirk Fury in the final of the Scottish men’s play-offs at Oriam on the same day. Before that, Queen Margaret University’s men meet Worcester in the BUCS Trophy final in Nottingham on Wednesday.